RENTON, Wash.--(BUSINESS WIRE)--Parallels® today launched Parallels Desktop® 9 for Mac, which lets customers run Windows and Mac applications simultaneously on a Mac without rebooting – the award-winning and No. 1-selling Mac desktop virtualization software for more than seven years and counting. Innovative and indispensable new features include cloud storage optimizations for iCloud, Dropbox, Google Drive and SkyDrive. Customers will also enjoy increased productivity with Mac OS X features like Launchpad in Windows applications and using the upcoming OS X Mavericks. 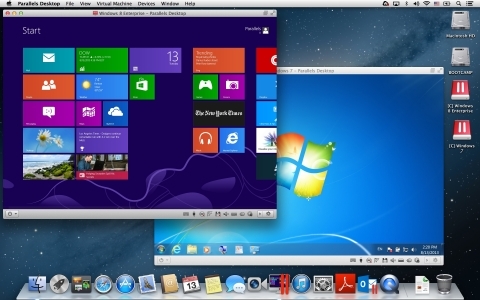 For Windows 8 users, Parallels Desktop 9 incorporates the familiar and much-missed real Start menu and Windows Start button. Starting August 29, current Parallels Desktop users can upgrade to Parallels Desktop 9 for Mac at www.parallels.com/desktop. For new customers, Parallels Desktop 9 will be available for purchase at retail and online stores and via the Parallels website starting on September 5. Everyone from business owners, to web developers, IT professionals, Mac enthusiasts, parents and students will benefit from indispensable conveniences of Parallels Desktop 9, such as improved performance, MacBook Power Nap functionality in Windows and Windows applications, connecting Thunderbolt and Firewire storage devices to a Windows virtual machine, improved security features, and increased flexibility for users with multiple monitors. Parallels Desktop 9 also enhances its support of Mac gestures inside Windows applications and offers Linux users enhanced integration with the Mac OS. Parallels Desktop 9 also delivers much improved performance for some of the most common scenarios and operations such as 40 percent improvement in disk performance; virtual machine startup and shutdown are now up to 25 percent faster; and customers can suspend their virtual machines in up to 20 percent less time than before. 3D graphics and web-browsing were also made noticeably speedier with up to 15 percent improvements for both. Parallels Desktop 9 for Mac customers also get an exclusive six-month subscription to the just-released and critically acclaimed Parallels Access for iPad, a breakthrough product for people on-the-go that “applifies” Windows and Mac applications on a PC or Mac, letting customers remotely access and experience them as if they were made for iPad. Now people can enjoy native iPad gestures even in applications not optimized for iPad. With Parallels Access, just tap right to what you need to get done, in any Windows or Mac application. Mac users with Parallels Desktop 9 can also enjoy the “applified” experience for their Windows applications, using Parallels Access from an iPad. Details about Parallels Access and a free trial are available here: www.parallels.com/access. Parallels Desktop 9 for Mac is available beginning Aug. 29, 2013, as an upgrade for current Parallels Desktop for Mac users. The full version will be available to new customers on www.parallels.com/desktop starting Sept. 5, 2013. Packaged software will also be available starting Sept. 5 at Apple retail stores, Apple.com, Amazon.com, Fry’s Electronics, MicroCenter and at other resellers and retail locations worldwide. The standard retail price (SRP) of Parallels Desktop 9 for Mac is US$79.99, and the Student Edition is available for US$39.99. Parallels Desktop 9 Switch to Mac Edition is US$99.95. Upgrades are starting Aug. 28 for existing Parallels Desktop 7 or 8 for Mac customers for US$49.99. For a limited time, Parallels Desktop 9 for Mac customers receive a complimentary six-month subscription to Parallels Access for the Mac where Parallels Desktop 9 is installed and activated, a $39.99 value. Details are available online at www.parallels.com/desktop. Parallels Desktop for Mac subscription offerings including business-class support, ongoing software updates and major version upgrades for Parallels Desktop for Mac Enterprise Edition are available by contacting the Parallels Sales Team at http://www.parallels.com/desktop/volume-licensing. Customers who purchased Parallels Desktop 8 for Mac from an authorized reseller on or after August 15 are eligible to upgrade to Parallels Desktop 9 for Mac at no additional cost. Customers who purchased from parallels.com or have a registered product activation key will automatically be emailed instructions on how to upgrade to Parallels Desktop 9. Details are available at http://www.parallels.com/techguarantee2013. Parallels Access for iPad is available for a 14-day free trial; annual subscriptions are $79.99 for each computer being accessed. The Windows device access capability is currently in beta with an extended free trial period of 90 days. Additional information and the app is available online at www.parallels.com/access. Customers interested in testing Parallels Desktop 9 for Mac can download a free trial starting September 5, along with in-depth information, videos and screenshots of the new features, at www.parallels.com/desktop. Parallels is a global leader in hosting and cloud services enablement and cross platform solutions. Founded in 1999, Parallels is a fast-growing company with more than 900 employees in North America, Europe, Australia and Asia. The Parallels logo, Parallels and Parallels Desktop are registered trademarks of and Access is a trademark of Parallels IP Holdings GmbH. All other trademarks are the property of their respective owners.